This is a roundup and comparison of the best rated robot vacuums currently available. Robot vacuums will automatically clean your rugs or hard floors while you do other activities. Some even have a remote control or WiFi APP so you don’t have to get up to start them. 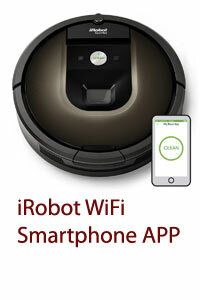 Both the iRobot 980 and the iRobot 960 can control your vacuum with a smartphone using the Built-in WiFi. 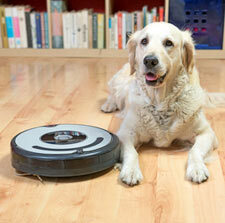 Many of the top robot vacuums have advanced features such as HEPA filtration (great for allergies or pets). Sensors and intelligent software onboard the robot vacuum keep it from getting stuck, or going down your stairs. Robotic vacuums can go where traditional vacuums can’t go (under furniture and other tight spaces). Most self-adjust to different floor types. Reviewers report that robotic vacuums do an excellent job keeping their floors and carpets clean. Below is a comparison chart of the top rated 2018-2019 robotic vacuums listed with top features, price and reviews. 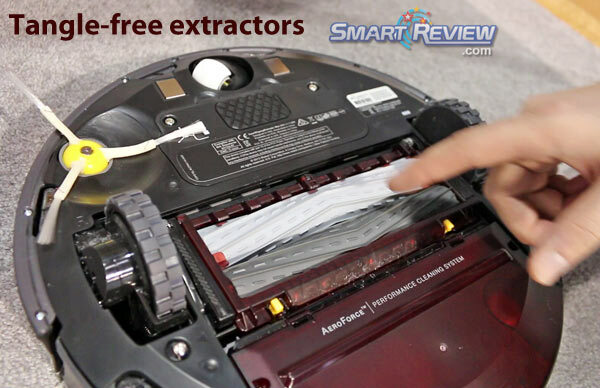 Tangle-free Extractors = These are unique to iRobot models. These extractors do away with the main brushes with a new durable rubber-tread design that avoids hair and pet hair tangles, great for pet owners. The extractors are easily removable for cleaning. These are available on the iRobot 890, the iRobot 960 WiFi, and the iRobot 980 WiFi models. On-Board Scheduling = Vacuum can be scheduled to perform cleaning sessions even when you’re not home. HEPA Filter = A HEPA filter is the best type of dirt filtration on a vacuum. This will remove the smallest particles of dirt, dust, and pet hair so that you don’t breathe in what you are vacuuming. This is especially important for those with allergies, and those with pets. The iRobot 890, the iRobot 980, the iRobot 960, and the Shark ION 750 have HEPA filtration. Virtual Wall = Available on iRobot Vacuums. Tells the vacuum not to enter a certain area, and restrict a robot vacuum to a specific area or room. An invisible barrier that the vacuum will not pass through. Such as a doorway. The iRobot 860, 960 and 980 models have a new type, called Dual model Virtual Wall, which have a new Halo mode, which will also allow you to keep the iRobot away from an object, such as a pet bowl. AeroVac = Most iRobot vacuums use this method of filtration. It maintain cleaning performance while reducing infiltration of dust, pollen and other allergens. 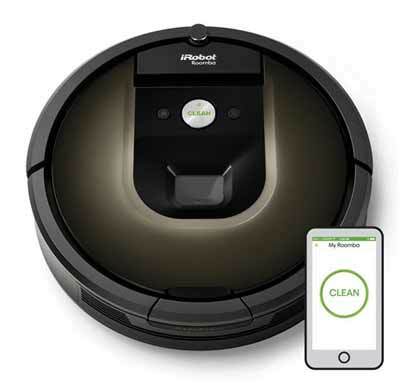 WiFi Connected/Smartphone Controlled = Some of the latest robot vacuums have built-in WiFi, which allows you to control, and schedule cleaning of your vacuum by using an APP on your smartphone or tablet. This means that you can be on your couch, or even away from your home and still be able to control your robotic vacuum. The iRobot 980, the iRobot 890, the iRobot 960, the Shark ION 750, and Neato Botvac Connected, all have built-in WiFi. Remote Control = Allows you to control the robotic vacuum from across the room. Even without a remote control most robot vacuums can be activated with the buttons on top of the vacuum. Lithium Ion Battery = This is the best type of battery available. You get longer life, faster charging, and more charge cycles with these type of batteries. The iRobot 890, the iRobot 960 WiFi, and the iRobot 980 WiFi, the Shark ION 750, and Neato Botvac Connected models all have lithium ion batteries. Multi-Floor = This robotic vacuum is suitable for all floor types, carpet, hardwood floors, laminate. Dirt Detect™ Sensors = Indicate where dirt is embedded in the carpet, so the vacuum can know to concentrate on that area. Only the iRobot 980 and the iRobot 960 have the latest Dirt Detect™ 2 technology. Pet Hair = This robotic vacuum is designed to better handle pet fur, hair and other fibers. Boundary Markers | Magnetic Strip = Neato Botvac and Shark ION robot vacuums use magnetic strip boundary markers you put across the floor to prevent the robot from crossing. Neato No-Go Lines = The newest Neato Robots have a Virtual No go line, where you can program the robot not to go past a certain area. D-shape design = Neato Botvac robot vacuums have a unique D shape, that helps it to get into corners that present challenges to round shaped robotic vacuums. Auto-Charge & Resume = This feature allows the robot vacuum to recharge its batteries, and then resume cleaning where it left off. This feature is only available in the iRobot 980 and iRobot 960 robotic vacuums, and the Neato Botvac D-Series Robotic Vacuums. Which Robotic Vacuum has the longest battery life? = Equipped with larger lithium ion battery packs, both the iRobot 980 and the Neato Botvac D5 Robotic Vacuums have the longest runtime of 120 minutes. Carpet Boost System = This feature available in the iRobot 980 provides up to 10x the air power on carpet and rugs, for better pickup of dirt, dust, and pet hair. 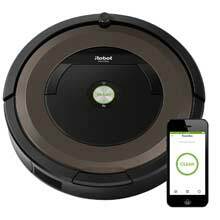 Differences between iRobot Roomba Models = There are many differences between iRobot models. The latest 960 and 980 models can be programmed and controlled with a smartphone using WiFi. The 800 and 900 series and on now have “Tangle-Free” rubber extractors, older models use brushes. The later models have larger dust bins. Navigation and cleaning software improves with every new model. Lasersmart Mapping = Neato Botvac D-Series robotic vacuums use LaserSmart mapping and navigation with real-time object detection. These vacuums Scan and map the room to clean your floors and rugs. Ratings and Reviews = We have found the iRobot brand to have the most consistent, excellent consumer reviews compared to other brands. For this reason, we are over-weighted with iRobot Roomba Robot vacuums on our site, since we only recommend top rated robotic vacuum cleaners. Full Bin Indicator = Full bin indicator lets you know when the dust bin needs to be emptied.